Currently in its fourth printing, Foucault Live is the most accessible and exhaustive introduction to Foucault’s thought to date. 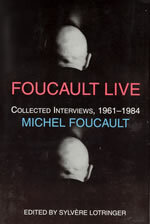 Composed of every extant interview made by Foucault from the mid-60s until his death in 1984, Foucault Live sheds new light on the philosopher’s ideas about friendship, the intent behind his classical studies, while clarifying many of the professional and popular misinterpretations of his ideas over the course of his career. As Gilles Deleuze noted, “the interviews in this book go much further than anything Foucault ever wrote, and they are indispensable in understanding his life work.” Most notably, Foucault Live includes interviews he made with the gay underground press during his stays in America during the 1970s. In them, Foucault suggests that homosexuality presents a new paradigm for ways of living beyond the predictable, binary couple. All of the philosopher’s interests, from madness and delinquency to film and sexuality, and their resultant writings, are probed by knowledgeable critics and journalists. After reading this book, the reader can explore key notions such as episteme, savoir and connaissance, archeology, and archive, without the knitted brow that plagued Foucault’s public when he was alive. This is the guide to Foucault’s life as an agent provocateur in the world of philosophy and scholarship.